There may no better illustration of how much harm the economy has inflicted on the American people during the Obama era than a March 2015 Harris survey commissioned by American Institute of Certified Public Accountants. The AICPA's Thursday press release reported that "a majority of American adults (51 percent) have delayed at least one important life decision in the last year due to financial reasons ... an increase of 20 percentage points from a similar survey conducted in 2007." Covering the survey's results, Ann Carrns at the New York Times, in an item carried at CNBC (also found at the Times's web site), waited seven paragraphs to note a particularly damning statistic about a situation Obamacare advocates like to claim has already been solved. Additionally I have found evidence indicating that if Harris had asked the "important life decision" question annually in its survey (the last time it appears to have done so was in 2009; the firm apparently adapts each year's survey to matters of interest to the AICPA), we would find that this year's 51 percent result is the worst, i.e., that life decision deferrals are at their post-recession peak, six years after the recession officially ended. ... The change was striking, and the percentages more than doubled in some areas. Nearly a quarter said they had delayed higher education, up from 11 percent in 2007, and 18 percent said they had put off retiring, compared with 9 percent in the earlier survey. Twenty-two percent said they delayed buying a home in 2015, compared with 14 percent in 2007. The AICPA survey was done in March, 14-plus months after Obamacare took effect.Yet the percentage of people putting off a medical procedure was more than double what it was during the awful Bush 43 era, to the point where it's now almost one in five Americans. That's a far higher percentage than any estimate in the past several decades of the number of Americans without health insurance. How can that be? I'll tell you how it can be. Obamacare's deductibles and copays are astronomically higher than they were with comparable insurance policies. Employers have responded to Obamacare's coverage mandates and its maze of regulations by sharply raising deductibles and copays in their own medical plans (but generally not to the level seen in plans available at HealthCare.gov). Obamacare's regulations on medical providers and insurance have added astronomically to their costs. Because of all of this, more people than ever can't afford costly medical care. In this critical sense, if one assumes that improving care was really the goal (a dubious proposition), Obamacare has failed, and it's really not disputable. The 19 percent who are putting off medical procedures are doing so mostly, if not completely, because they are, for all practical purposes, uninsured. The new survey, conducted by phone for the American Institute of CPAs (AICPA) by Harris Poll in March among 1,010 adults, found many of the specific life events Americans are delaying for financial reasons have more than doubled since the 2007 survey. Every one of the metrics except Buying a Home increased by more than the overall 65 percent increase, and either doubled or more than doubled. The sum of the six individual percentages in the AICPA bullet points above, which was 54 points in 2007, skyrocketed to 108 points in 2015. This simply has to mean that that a far higher percentage of those surveyed were delaying more than one major life event in 2015 compared to the respondents in 2007. Further, the AICPA survey disclosed the answer to an overall "delay of major life events" question in its 2008 and 2009 surveys. It appears not have asked the question again until this year. The answers obtained in those two years were 41 percent and 42 percent, respectively. 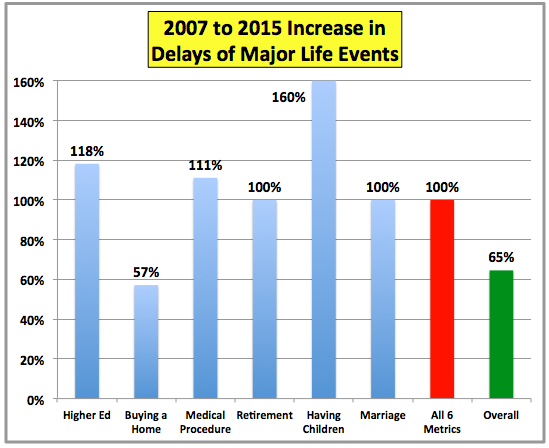 Even though the recession officially ended six years ago, the percentage of Americans delaying major life events has still significantly increased, and, at the reported 51 percent, is very likely at its post-2007 peak. Trillions of dollars of stimulus, deficits, and quantiative easing, and even Obamacare, and this is what he have to show for it. How's that hope and change working out for everybody? As would be expected, the AICPA kept President Obama's name out of its press release. Ann Carrns at the New York Times didn't have to do that, but did. Is there even a sliver of a chance that she would have kept the name of a Republican or conservative president out of her report if these kind of results were seen during their administration? Of course not. She would have run to any Democratic Party and leftist politician and activist she could find to get quotes raking that president over the coals. Assuming they don't try to ignore it, I can't wait to see how Paul "Obama uber alles" Krugman and his ilk try to blame all of this on anyone other than Obama and the left.